Stocks could look to bounce later in the week, after the worst Christmas Eve performance ever, but some strategists expect only a half-hearted rally attempt with more losses to come. The S&P 500 lost 2.7 percent Monday, to 2,351 in a half-day session, and is now officially in a bear market — or down 20 percent from its intraday high. The S&P broke the psychological 2,400 level Monday, and technical analysts are now looking for a move that could take stocks to 2,300 or even lower. But Andrew Brenner of National Alliance said the month-end maneuvering and year-end action of some funds may actually give a lift to stocks in the last days of December as managers rebalance holdings by reallocating funds from their bond holdings to the stock market. The S&P is now down 14.8 percent for the month of December, the worst December on record. About 96 percent of the stocks in the S&P 500 are down 10 percent or more, and 70 percent have lost 20 percent or more. But there are other forces that some strategists say could hold the market back from a rally this week. “With volume expected to be pretty light this week, you could see some people who are looking to push prices lower just so they could make money with shorts. This is likely to be a trader-driven market this week,” said Sam Stovall, chief investment strategist at CFRA. Stocks sold off Monday as investors looked warily at Washington, where President Donald Trump was again criticizing Fed Chairman Jerome Powell, and the government remained closed after a budget standoff. “Right now the market is in limbo. I think it’s waiting for a reason to rally. I don’t really see any reason to rally before year-end,” said Stovall. Stovall expects the budget battle to continue. “I basically see nothing happening that will be encouraging out of Washington,” he said. “What more can Washington do?…That has always been the question. What more can Washington do used to be for us, now it’s to us,” he said. 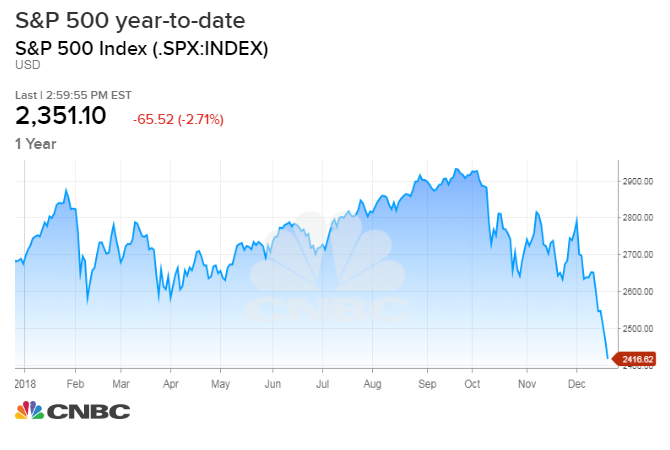 Doug Roberts at Channel Capital Research notes that the market may not be so great after New Year’s either, and it’s too early to determine the effects of the market downturn on investors and the economy. “People are distracted by the holiday season and may view this as nothing more than an overdue correction. This could change dramatically when people see the losses on their brokerage statements in January. This could trigger another wave of selling and cause a pullback in consumer spending,” he wrote in a note. Technical analysts are watching several key levels after the S&P formed a negative head-and-shoulders top pattern. The S&P could test 2,300 and down 2,250, based on the chart. Redler said the market could trade differently later in the week, based on rebalancings, but the tone remains negative. “Even people who were bearish and looking for a corrective phase weren’t looking for such a fast and furious move from highs to lows. Those that were thinking we’d see 2,250 were thinking more for the first or second quarter next year, not by New Year’s,” he said. Markets are closed Tuesday for the Christmas holiday, but after that, trading hours are normal through the end of the year. On Wednesday, S&P/Case-Shiller home price data will be released at 9 a.m.